When the Clearwater-headquartered UPARC decided to add tennis to its menu of healthy options for its intellectually and developmentally disabled clients, it didn't realize it already had a long-time ally in its own community. UPARC made an inquiry regarding existing Adaptive Tennis programs to the USTA (United States Tennis Association) national body, which said there were no programs in the area -- but there was an organization ready to help. "It had been a long-time personal goal of mine to start an Adaptive Tennis program in the area, and this was the perfect opportunity," said Judy Foster, executive director of the Suncoast Tennis Foundation, an official USTA Florida Community Tennis Association, located in Clearwater. "By a wonderful coincidence, I was not only good friends with UPARC Associate Executive Director Brian Siracusa, who had made the inquiry, but I was very familiar with UPARC, having volunteered for some of their programs." A partnership between the two organizations was formed in January of this year, and the Adaptive Tennis program debuted in April with 16 UPARC participants taught by Dawn Lewellyn, a certified therapeutic recreation specialist, and other experienced volunteers. The program is held on two donated city tennis courts, negotiated by Foster and the City of Clearwater Parks and Recreation Department. "We wanted to offer Adaptive Tennis to encourage healthy lifestyles for our clients," said Siracusa, whose organization serves more than 250 individuals daily, "and create a fun atmosphere while promoting physical fitness." By the end of the first week, participation had ballooned to 30 players. The program is now presented twice a week for one hour. The first series ran through April and finished at the end of May, at which time certificates were awarded to 40 participants. Additional series will be held starting in September and running through mid-December. Funding for the program was provided by the USTA Florida Section Foundation, which carries out the charitable purposes of USTA Florida, providing tennis opportunities for players of all abilities throughout the state. UPARC applied for two grants and was awarded an equipment grant for $1,600 to purchase USTA Youth Tennis equipment appropriate for the Adaptive Tennis program, and a $3,750 program grant to fund a professional instructor for all three series. "This is an important issue to the Foundation and we are so pleased that organizations across Florida are bringing the game to special-needs populations," said B.J. Bishop, president of the USTA Florida Section Foundation. "We will continue to work to make funds available to these special programs." After the early success of the program, UPARC plans to offer the Adaptive Tennis program to a number of their satellite sites this fall. 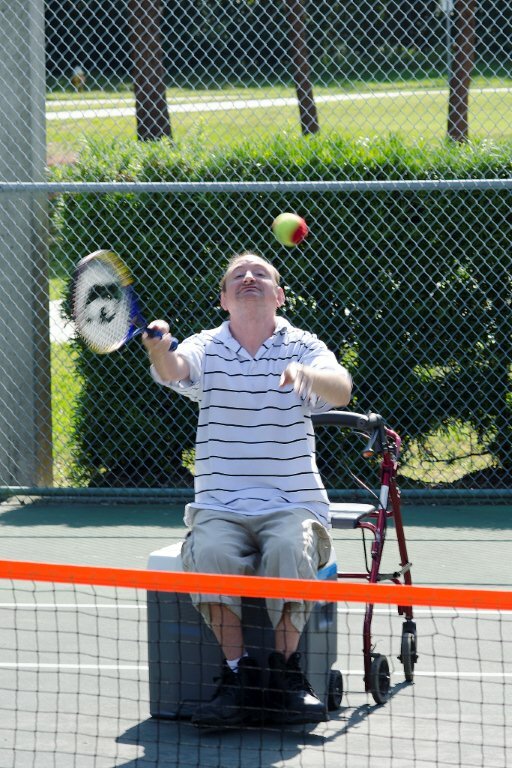 "The Adaptive Tennis program is a part of our community tennis association's mission," said Foster of the Suncoast Tennis Foundation, "and we also have plans to offer the program to an expanded public in the near future."